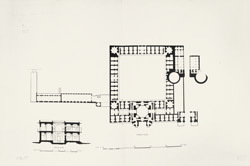 Pen-and-ink plan of Azam Khan's palace at Ahmadabad, Gujarat, by an anonymous draughtsman between 1884 and 1886. This image is from the Burgess collection, an album of 49 drawings of plans, sections, elevations, sculpture and architectural details of Muhammadan monuments in Ahmadabad and the surrounding areas made between 1884 and 1886. The drawings were prepared mainly by Indian draftsmen under the supervision of James Burgess (1832-1916) of the Archaeological Survey of India. Situated on the banks of the Sabarmati River, Ahmadabad was founded by Ahmad Shah, Sultan of Gujarat, in 1411 on the site of the village of Asaval. This palace, dated 1636, was built by Azam Khan, the 23rd Viceroy (1635-42). It was first used as a caravanserai or traveller’s rest house. Under the Marathas it became the residence of one their military leaders and under the British it was changed into a jail. The north entrance leads into an octagonal hall, underneath which is a splendid vault entered by a flight of steps at each side, with a reservoir and a fountain. Behind the jail and inside the Bhadra wall was a small garden worked by the convicts.